The Iguassu Falls are considered one of the main natural spectacles in the world and it is one of the best vacation packages to take from the city of Buenos Aires. 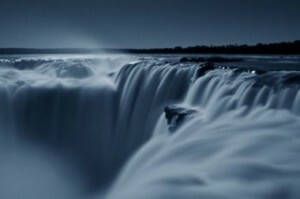 The original inhabitants the Guarani Indians called the falls Iguazu, which in their language means “Great Waters”. 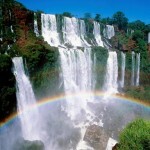 The Falls are shared by Argentina and Brazil, as the Iguazu River is the boundary of these two countries. 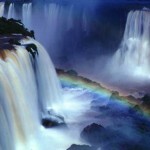 The Iguazu Falls are safe guarded in both countries Argentine and Brazilian for National Parks. The area is framed by the lush jungle in one of the most bio diverse regions of the continent. 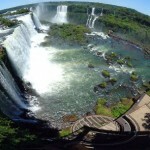 The visits to the Falls begin in the city of Puerto Iguazu (Arg) and Foz do Iguacu (Bra), the area is known as the “Three Frontiers point” because through the confluence of the Parana and Iguazu River limit Argentina , Paraguay and Brazil. The Iguazu Falls are within an ecological conservation area (on the Argentine side Iguazu National Park) and the area is one of the most bio diverse areas of the all South America. The Iguazu Falls are visited annually by millions of tourists that take vacation packages from Buenos Aires, San Pablo and Rio de Janeiro. 1985 the Iguazu falls were declared “World Heritage” by UNESCO and in 2011 was named as one of the New 7 natural wonders of the world. 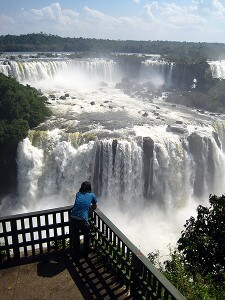 Visit the Iguazu Falls from Argentine side is like stepping into the very heart jumps and waterfalls. The walkways lead visitors to tour the spectacular waterfalls from different angles. Reaching the very edge of the Garganta del Diablo is a unique experience. The circuits of The Iguazú National Park (Argentine side) are: Lower, Upper, Devil’s Throat, Isla San Martin and trails Yacaratía and Macuco. All these circuit and trails are included in the price of the Iguazú National Park entrance fee and they are the best part of a vacation package to the Iguazu falls. This center was named Yvyra Reta in Guarani means land of the trees. It occupies the most important building of the new facilities of the National Park. It is divided into two themed rooms, one above the other on nature and human activities in the region. It highlights the panels dedicated to the ants and butterflies. A set of gateways strategically designed to allow many different views of the Iguazu Falls and an intimate encounter with waterfalls and charming corners of the jungle. Shaded and very good view of the Iguazu falls. Duration: 2 Hrs Difficulty: with stairs. 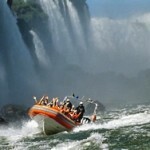 Access to the magnificent views of the Iguazu Falls and Iguazu River delta formed by a set of lush islands. Walk with beautiful views from above the falls. Duration: 1:15 Hrs Difficulty: no stairs.